When I was at the store last week, I got a great deal on colored bell peppers. We aren’t big green pepper fans in our house, but give us red, yellow or orange anytime. I try to keep them sliced in baggies so the kids can grab them for a quick snack. We especially like to dip them in hummus — it is so delicious. Those of you who are regular readers of our blog know that my family loves the flavors in Southwestern food. I had some leftover grilled fajita chicken strips and my bag of colored peppers. Normally I would saute onions and peppers in some olive oil, but it was really hot and I didn’t feel like turning on the stove top. 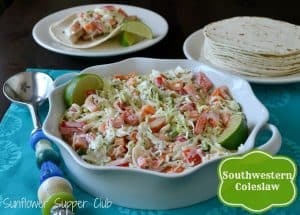 I was looking through my recipes, came across my Chipotle Grilled Chicken Tacos with Pineapple Slaw, and thought maybe a Southwestern slaw would make an easy summer dinner. This would also be yummy served as a side to other grilled meats or burgers. Whisk the dressing ingredients together in a small bowl until combines. Set aside. In a medium bowl, mix the cabbage, red bell pepper, orange bell pepper, and the green onions. Toss to combine. Add the dressing and toss to combine. Place in the fridge for 2-3 hours to let the flavors combine. Serve with grilled fajita chicken on tortillas or as a side dish. Thanks so much Carole! We will be sure to check it out. Have a great rest of the week!